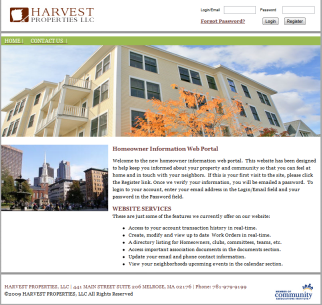 Harvest Properties provides our clients with online tools and resources that are helpful to homeowners in the associations that we manage. We have two levels of resources, a section that is general and available to all homeowners through the Resources menue at the top of our webpage, and an association specific section that is password protected and requires the homeowner to have a username and password. Each homeowner can login to the Association website with a secure user name and password. The website can be customized to provide any information that is deemed necessary to effectively manage the property. Access levels can be created to provide different information to trustees, committee members or homeowners. Clients register and login using the Client Login icon.